We've been working hard replacing our current graphs with new a graphing software highly customised for Old School RuneScape. 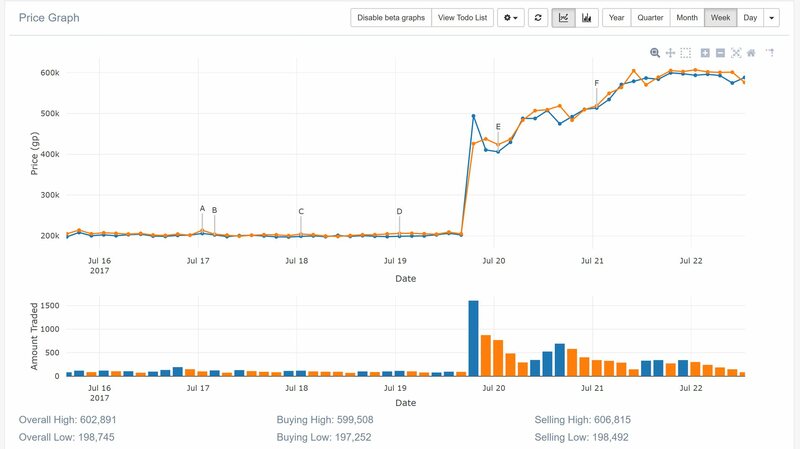 These graphs feature 10-minute interval price data (day graphs), and a colourised volume graph embedded right below the price, so you can see when there's been a spike in buy/sell offers, and immediately see how the price has been affected. These new graphs are still in beta, so they will need to be toggled on and off. As they are still in beta, we welcome any feedback you may have, as well as feature suggestions to implement into the graphs for full release.